The MDC-64 Is a large Fiber Duct tube cutter designed to cut Fiber Ducts (up to 64mm/2.52" in diameter), PVC, CPVC, PE, HDPE, PEX and other nonmetallic tubing. 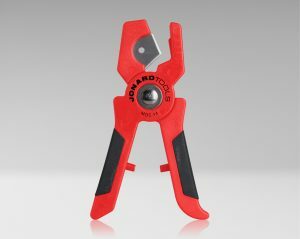 This ratcheting cutter provides high leverage to facilitate cutting with minimal effort. Comfortable one hand operation and easy open release. 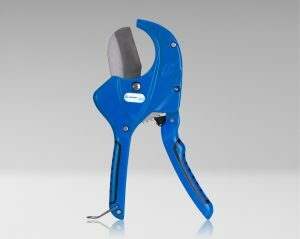 Provides square and straight cuts with no mess when compared to other saw type pipe cutters. The Triangular blade shape helps to hold the tubing as well as helps to reduce cutting force. Tool body is Die Cast Aluminum alloy and cutting blade is made from Stainless Steel for long life. Safety latch at bottom of handle keeps handles together to prevent tool from opening and exposing the cutting blade. At FiberOptic Resale we offer cleaning / calibration and repair services for fusion splicers and cleavers keeping them operating like new. We have on-site technicians that have the experience and expertise to diagnose and repair older splicers as well as the newer more difficult to troubleshoot fusion splicers. We pride ourselves in being customer focused to deliver prompt and responsive service. FSM-70S, FSM-70R, FSM-60S, FSM-60R, FSM-50S, FSM-40S, FSM-30S, FSM-17S, FSM-16S and more. Quantum Splicers, Type 65, Type 63, Type 45, Type 39, Type 37 and more. S178, S153, S123, S177 both V1 & V2 and more.